Pastelitos, croquetas, café cubano, oh my! The University of Miami has finally embraced its roots and entered the world of Cuban cuisine by replacing Innovation Kitchen in the food court with Vicky Café. 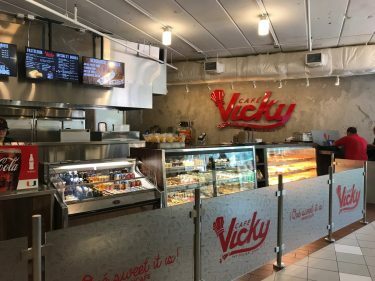 Vicky Café is a subsidiary of Vicky Bakery, a Miami-based Cuban bakery that began as a single storefront in Hialeah in 1972. Now, 45 years later, UM’s Vicky Café will be the 18th Vicky’s in South Florida. “We are excited about continuing our proud tradition and growth, and even more excited about being a part of the University of Miami family,” said Pedro Cao, president of Vicky Bakery and Vicky Enterprises. UM dining began the initiative to bring Vicky Café to UM after asking Student Government for input on behalf of the students. Student Government President Adrian Nuñez already enjoys the Cuban flair Vicky’s brings to campus. For those familiar with Vicky Bakery, Vicky Café is similar to the main chain, with minor differences, said Larry Milian, corporate marketing director for Vicky Bakery and Vicky Café. “Along with all the Cuban goodness Miamians know and love from Vicky Bakery, Hurricanes will be treated to new menu items like Wynwood’s Panther Coffee and Calle Ocho’s JoJo Tea,” said Alicio Piña, co-owner of Vicky Café UM and University of Miami alumna. Prices at Vicky Café range from $1 to $8.95, and items include Cuban staples like pan con bistec, tostadas and café con leche. Alex Voutsinas, a junior studying computer science and art, is one of many students excited about Vicky Café. “I like how the croquetas are here all the time, and I also really like the fact that they have the buzzers because then I can walk around a little bit and not have to worry about someone stealing my food,” said Voutsinas. Voutsinas also pointed out that the service she has received so far has been friendlier than that of Innovation Kitchen. Vicky Café has found a fitting venue at the University of Miami, bringing its original Cuban flavors to students. In this partnership, Vicky’s will have UM students saying “Que bueno!” after every meal.